Eltronicschool. - This is one of 555 and CD 4017 IC circuit schematic application for building PIR triggered message player. 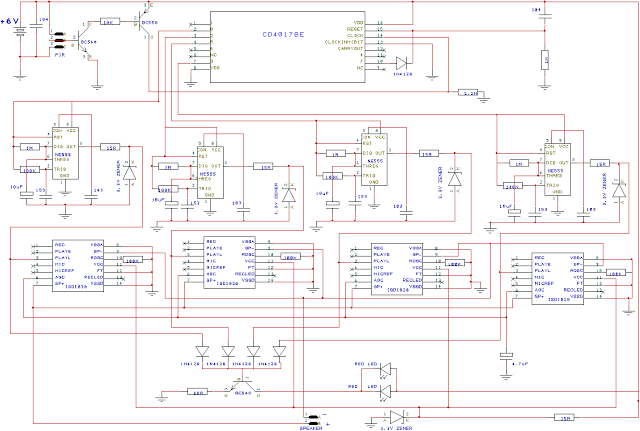 In this circuit schematic so the main component are PIR, CD4017 and NE555 IC. Beside we will give you circuit schematic of PIR Triggered Message Player using CD4017 and NE555 IC, we also will give you the component parts and description globally of this circuit schematic, and the last we will give you link to read more about this article from original source. Circuit schematic like in Figure 1 above is PIR Triggered Message Player using CD4017 and NE555 IC. According Electronic Circuit Projects site describe that a casual observation makes us feel that the circuit is without any flaws, and practically too it seems to be working fine, however the design has much room for improvements and for making it technically more sound.